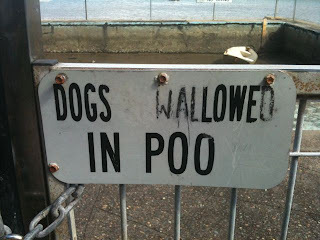 Things I like about Sydney No. 34: Tidal pools. There are many tidal pools in Sydney for those too terrified to venture out into shark-infested waters. If you have followed my recent advice and walked from Bondi to Clovelly you will have seen a whole bunch of them. Also known as ocean baths, tidal pools are cut into the base of cliffs and rocks at the edge of many Sydney beaches - thirty between Palm Beach and Cronulla alone - providing all the thrills of swimming in the ocean within a safe, confined space. Some of them date back to the ninteenth century and these earliest ocean baths were built because swimming at beaches in daylight hours was illegal until 1903. Furthermore, landowners didn't want swimmers near their properties and they frequently had them arrested. Many of the later tidal pools were built by unemployed labour during the depression - swimming was and is a free activity after all. There have been many photographic studies made of all these tidal pools, entire exhibitions dedicated to them, articles extolling them, theses written about them: this is emphatically a city obsessed with its prime waterside location. As a reluctant swimmer (and Sydneysider) I am hardly qualified to join in this chorus of adulation. 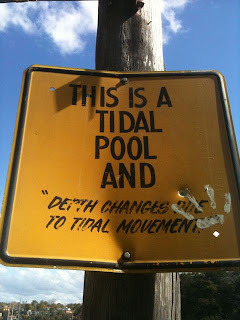 Which is why I have picked my favourite ocean pool as being one over here on the North Shore, in Tambourine Bay. It is a tidal pool with no tide. A bath with no bathers. A swimming pool with no water. 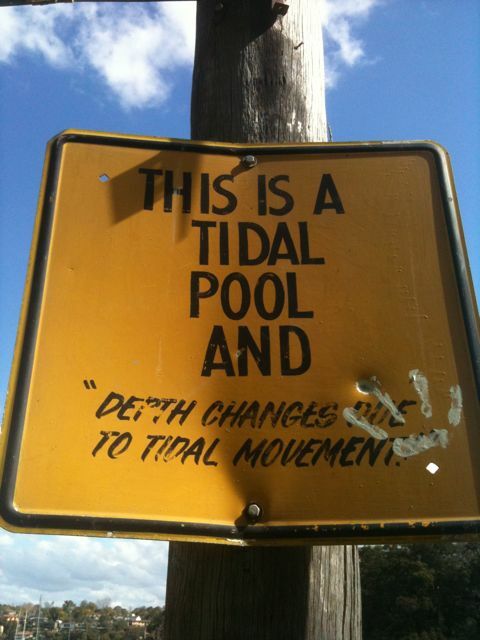 A remembrance of tidal pools past. As you can see, this tidal pool needs (to quote the local Council's newsletter) "extensive repairs". There certainly can be 'NO DIVING' in the foreseeable future. 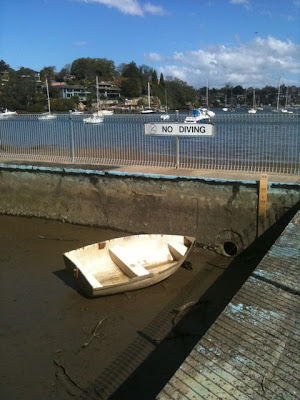 Its blue paint has peeled, its measuring stick, optimistically warning of depths of up to 1.5 metres, remains permanently dry and a boat is docked on the pool's bed as if haphazardly thrown to its fate. 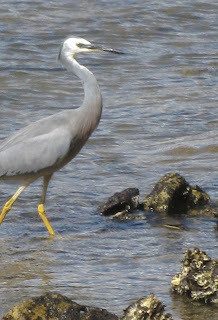 The occasional heron stalks past its beached bow, leaving scratchy footprints in the dirt, but otherwise nothing larger than a crab takes the plunge. 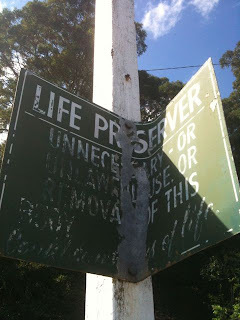 I think it is probably the local scouts who are responsible for the editing of the warning signs around the pool, for there, over to the left, stands the 1st Tambourine Bay Sea Scouts hut. 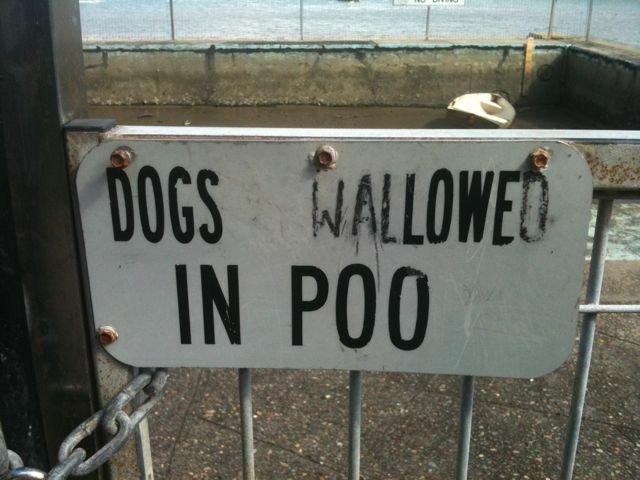 Who can resist scratching out an 'l' in order to change pool to poo? Not the sea scouts, oh no! ....for the tide is long gone. These days, the sea scouts have to banish all hopeful thoughts of swimming from their minds. The wrack and ruin of Tambourine Bay's tidal pool seems to have been both swift and thorough. How soon the things of man can fall and decay. Or in this case the things of woman - for Tambourine Bay was named after a notorious prostitute called Tambourine Nell who hid out in the bay, on the run from the police, setting up camp and managing to elude captivity for quite some time. This was before tidal pools and sea scouts and me and Sniff and you and blogs. Nevertheless, I feel sure that, one day, whilst staring out to sea and pondering her future, Tambourine Nell saw a heron stalking across the shoreline, identical in every way to the one I saw this week making a serene and dignified journey away from the confines of the tidal pool. I remember walking here in the 60s when we were small children. The pool was filled with green water. I swam there as a teenager and developed an itchy red rash. The rocks nearby seep with an oily orange liquid, maybe sewage. I loved coming here as a child - it was so melancholy - it felt like the 1920s.